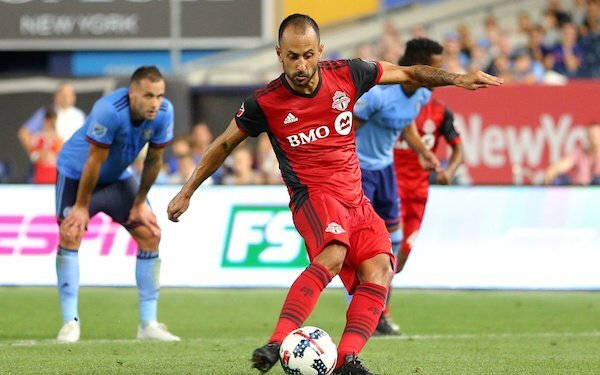 Victor Vazquez, one of the major pieces of Toronto FC's historic treble run in 2017, will be leaving MLS. The big question for the Reds' faithful, though, is what will happen to TFC's three big stars: Jozy Altidore, Michael Bradley and Sebastian Giovinco. 'Loyal servant.' TFC has agreed to allow Vazquez, 32, to join a yet-to-be-named club in Qatar after two seasons in MLS. He departs with 16 goals and 25 assists in 52 games, though injuries limited his playing playing in the 2018 MLS season and during TFC's run to the Concacaf Champions League final. “Victor has been a loyal servant to the club, a fantastic player and an even better person," Gregg Vanney told Toronto reporters at the club's media day on Tuesday. "This opportunity came up for him and his family." The move came less than a year after Vazquez was given a contract extension that locked him in until 2020, but Toronto FC already has some targets in mind to replace Vazquez in midfield, where he combined with Jonathan Osorio, Marky Delgado and Bradley to lead TFC to its first MLS Cup title, scoring the second goal in the 2-0 win over Seattle. 'Bittersweet in a way.' On the other hand, this is the last year of the current deals for Bradley, who arrived in 2014, and Giovinco and Altidore, who moved to Toronto in 2015. While Bradley is in Chula Vista, California, with the U.S. national team for January camp, Giovinco and Altidore are in Toronto, where the Reds have begun preparations for another run in the Concacaf Champions League. Giovinco ($7,115,555.67) and Bradley ($6,500,000) were the two highest-paid players in MLS in 2018 and Altidore ($5,000,000) was seventh, according to figures released by the MLS Players Union. Given those amounts and their ages -- Giovinco and Bradley are 31, while Altidore is 29 -- it is hard to imagine all three players returning to Toronto in 2020. "I’ve never had this situation,” Altidore told reporters on Tuesday. “It’s bittersweet in a way because you don’t know what the future holds, but it doesn’t change anything for me -- my relationship with the fans. It doesn’t make me want to play any less, with any less emotion." Like Altidore, Giovinco says he wants to stay in Toronto but admits he is uncertain. “I'll try to honor my contract," he said. "We’ll see what happens." Vanney said the simple solution would be to keep the three Designated Players, but he admitted it should be expected that they weigh their options as they continue their daily routine to prepare for the 2019 season. “I think these guys are professional in that way," he said, "and I don’t think it will be a distraction in terms of their playing." Goalkeepers (2): Alex Bono, Caleb Patterson-Sewell. Defenders (11): Auro, Laurent Ciman (Dijon/FRA), Nick DeLeon (D.C. United), Julian Dunn, Nick Hagglund, Chris Mavinga, Drew Moor, Ashtone Morgan, Justin Morrow, Gregory van der Wiel, Eriq Zavaleta. Midfielders (8): Michael Bradley, Jay Chapman, Aidan Daniels, Marky Delgado, Griffin Dorsey (Indiana Univ. ), Liam Fraser, Jonathan Osorio, Victor Vazquez. Forwards (5): Ayo Akinola, Jozy Altidore, Jon Bakero, Sebastian Giovinco, Ryan Telfer. 1 comment about "MLS 2019: One Toronto FC star is leaving, future of three others uncertain". R2 Dad, January 16, 2019 at 8:49 p.m. Odd to talk about a transfer without detailing any of the dollars trading hands, which would better explain the motives. Was there a transfer amount associated with this "migration" of VV to Qatar? I suspect there is but MLS doesn't want to talk about it, preferring to sound magnanimous about "sending", "moving" or some other euphamism for "sell", "loan" or "trade". If Garber is going to talk about ROI of the DA investment, we also expect details on the transfers--just like any other club/league. Apparently VV's value is 1.75M euros--curious if the transfer came in under that because Toronto needs to refresh their lineup.